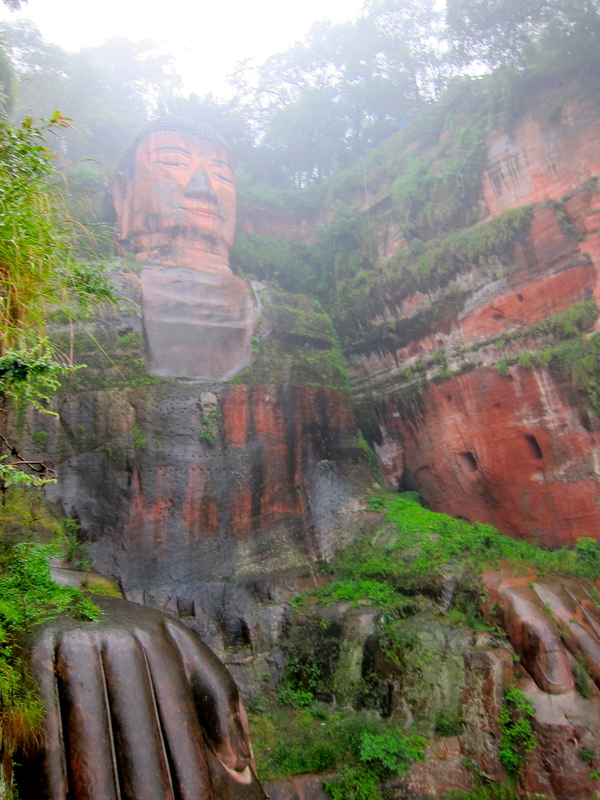 About 2 hours outside of Chengdu, in Leshan, is the world’s largest sitting Buddha, taking residence on the river in Sichuan Province. Having lived in SE Asia for 5 years, I felt as if I might be Buddha’ed out and I wasn’t entirely convinced it would be worth the 4 hours in the car. But I was very wrong. First off, as you would expect, the statue is massive – so massive in fact that a grown man is the size of one of Buddha’s toenails. At 71 meters tall, it is hard to imagine how this was created in the 8th century using primitive tools. No wonder it is on the UNESCO World Heritage Site list. To see the full length of the tallest pre-modern statue in the world, one must climb down one side on very small stone steps carved into the mountain. 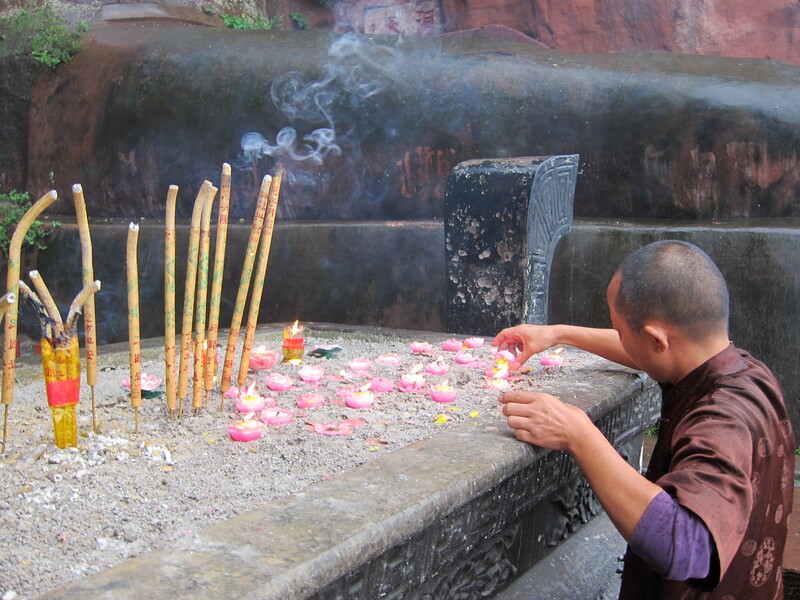 On he banks of the river you can stare up at the great giant and watch monks burning incense. And then of course, you must also climb back up! This is a difficult journey, so if you are older or perhaps not very fit, expect it to be challenging. 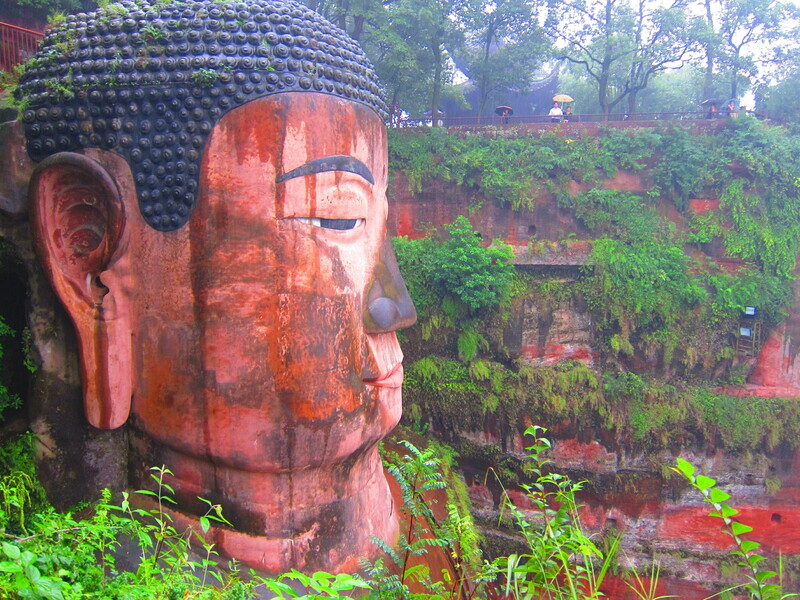 Leshan’s Buddha building was led by a Chinese monk named Haitong who hoped that the presence of a Buddha would calm the turbulent river waters, thought to be a water monster, so that ships could safely pass. It is said that so much stone was taken from the cliff and deposited in the river below that it did in fact change the currents making the waters more safe for ships to pass through. Also, quite uniquely for its time, the statue has a sophisticated drainage system that includes pipes carved into various parts of the Buddha’s body to allow smooth draining of rain water to prevent unnecessary ageing and degradation. Amazing, I must say you have to see it to really grasp the enormity of it – you’ll notice even in the photo, it is so tall even the air around the head is foggy when pictured from below.